Well, I decided to start this week off with...you guess it another put option. I've been eyeing V.F. 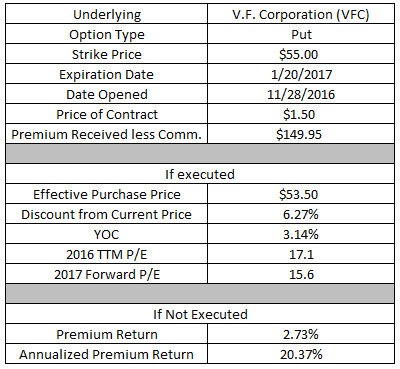 Corporation (VFC) for a few years now and while I felt it offered a decent prospect about a year ago there wasn't much of a margin of safety. Since then the share price has continued to drift lower and is now sitting around $56 which looks like a much better proposition. V.F. Corporation is a Dividend Champion with a dividend growth streak over 40 years in the making. That's an impressive streak and speaks to the quality of the business. Much has been written about the looming downfall of brick and mortar retail and that's a very serious concern for anything related to retail. However, V.F. Corporation is a bit insulated from that since they don't actually own or run those store fronts; rather they make the products that people are after. So even if brick and mortar retail does continue to lose market share to online shopping, V.F. Corporation should still do fine over the long run. If the share price of V.F. Corporation falls below $55 then the put option would move "in the money" and could be executed. If executed I would be forced to purchase 100 shares of V.F. Corporation for the strike price ($55) less the premium received ($149.95/100) or $53.50. That works out to about 6.3% of downside protection. Typically I aim for higher downside protection when I write puts to make sure I buy shares at a discount. However, I wouldn't be opposed to buying a few shares at these levels so I decided to aim for less downside protection. Although, if the analyst estimates are right then it's not exactly a bad proposition as the P/E based on 2016 estimates would be 17.1 and based on 2017's estimates it would be 15.6 and the YOC would be 3.14%. If the share price remains higher than $55 then I'll get to keep the option premium as profit. Based on the capital at risk that would represent a solid 2.73% return in a little less than 2 months or 20.4% on an annualized basis. If you remember towards the end of October I wrote a put option on AT&T with a $36 strike. Well, the day after I opened that position just happened to be the day that AT&T announced it's intentions to buy Time Warner to add a content creator to the mix. The agreement wasn't exactly well received with AT&T's share price declining from around $38 to just over $36 seemingly over night. Much of that was likely due to the Time Warner deal specifically the fact that AT&T was having to finance a significant portion of it with debt on top of assuming Time Warner's debt. Cooler heads have prevailed or the Trump rally has taken over or for whatever reason the share price is back up over $39.50. Since I wasn't a fan of the deal and the share price has climbed higher I decided to buy to close this put option for a decent profit. It worked out to just a $35.01 total gain in the 5 weeks or so that the position was open. That works out to a 0.97% return or 9.75% on an annualized basis. 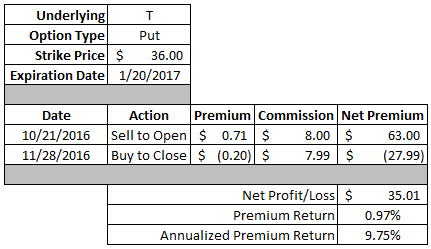 Not great, but I'm not going to complain about turning a solid profit on what I considered to be a fairly conservative deal. Just for some perspective the recently dividend was boosted up to $0.49 per share. Comparing the premium return to the dividend means that I was able to capture 70% of a dividend payment just to agree to buy shares at a discount. That's why I consider put options to be the best of both worlds when done conservatively. My options activity is slowly looking better after the big mis-step with my Target Corporation (TGT) call option that I ended up rolling up and out. Thus far in November I've generated $166.74 net profit from writing put options and $226.41 of extra income over the last 3 months. Since the Target call is technically still open since I rolled it out it really shouldn't be included in the running totals just yet. Excluding that call option pushes the November total to a $490.48 profit and a profit of $550.15 over the last 3 months. My options activity looks better now with a net profit during November of $131 and $191 of net profit from September though thus far in November. I don't expect to open any new option positions, although I've said that before. Within my Rollover IRA I'm potentially on the hook for over $58k worth of purchases via put options. That's brushing up on my hard limit of 50% of assets from my Rollover IRA being used for options so I don't expect too much more activity until some of my open positions expire or are closed. Although I'm always on the lookout for chances to close out put options early if I can lock in a solid profit and also reduce my exposed capital. 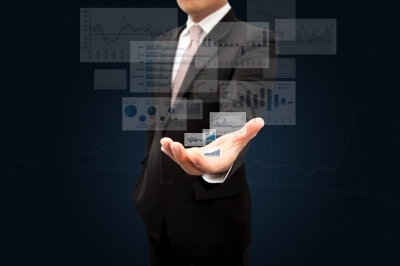 Do you incorporate an options strategy within your portfolio to generate extra income or buy shares at a discount? I sold the same VFC option, but with an earlier expiration date. $55 strike expiring on 12/16. I'm hoping it expires worthless, so I can sell a few options before landing 100 shares.